One summer is an interesting proposition for a book, telling a somewhat chronological story of a few months in time. 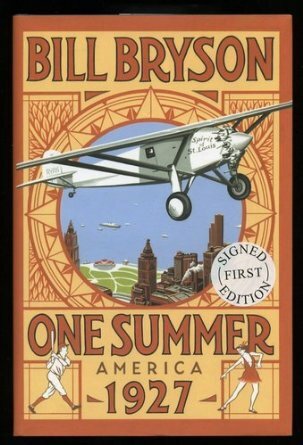 The fact that the summer of 1927 in America was one of the most fascinating periods in modern history makes for a compelling tale indeed. Having read previous Bill Bryson books, A Short History of Nearly Everything and Shakespeare, World at Stage, (both of which I recommend despite them being rather heavy reading!). I was excited when I came across a new book emblazoned with his name and ‘The Spirit of St Louis’ flying across the cover. The book follows the main headlines of the year, focussing loosely on the biggest events in the months of May, June, July and August. Each of these months have particular focuses, these are; Charles Lindbergh, Babe Ruth, President Coolidge and alleged anarchist murderers Nicola Sacco and Bartolomeo Vanzetti. Whilst these figures are the focal points of the chapters, there are numerous other stories interwoven with them. The talent that Bryson uses to maximum effect, is to pick out of history what’s interesting, something which many historical fiction books fail to recognise or achieve. This results in a thoroughly entertaining, absorbing book which entices the reader to continue on. Brysons writing style brings the period to life, his constant comparisons to modern day life illuminate the vast contrasts between then and now. You feel the optimism of the roaring twenties pulsating from every page. The wild excesses of the time highlight what a remarkable and unique period it was, particularly in America. The book is fantastically well researched, with a wealth of information everywhere you look. All this information is written in Brysons trademark light-hearted style and I believe this to be the most readable Bryson book to date, from my experience. A criticism that can be voiced about this book is it’s somewhat disjointed format. The action seems to jump arbitrarily between events. The chapters are named after a figure but only parts of the chapter talk about them. Some of the jump off points for the topics are supported by tenuous links. One moment you will be reading about Babe Ruth, then Charles Linbergh and then Henry Ford, all in a couple of paragraphs. The action also deviates from the year 1927, as the title of the book suggests, but goes on to discuss events throughout the twenties and beyond the forties. This makes the title of the book at the very least, a little bit misleading. However neither of these are an issue for me, if anything they add pace to the action and underline what a remarkably busy summer it was. The jumping between different time periods help to give contextual background to the events of 1927. I would rate this book as 9 out of 10, for the simple fact that it is truly entertaining, informative and completely absorbing. I found this book very difficult to put down and for those reasons it goes down as one of my literary highlights of recent years.